Poly tank accessories are an economical way to add needed features to water or septic tanks, drums or pallets, and various other chemical tanks. Storage plastic tank accessories for septic and water tanks include manhole extensions and lid and riser combinations allowing you to adjust, customize, and secure your tank to its needed specifications. 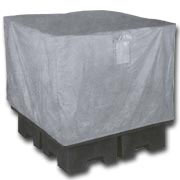 To protect your oil drums or pallets from outside weather, an outdoor storage cover is designed with an elastic bottom that allows it to stay secure regardless of outside elements. If you need an effective and economical restraining system, tie down kits contain PVC coated wire cable and adjustable steel turn buckles that will help secure your tank in any non-seismic condition. Other accessories and coatings are available upon request. Tank accessories can also be used for rainwater storage tanks above or below ground. Please see Poly Tank Fittings for a complete listing of available options.